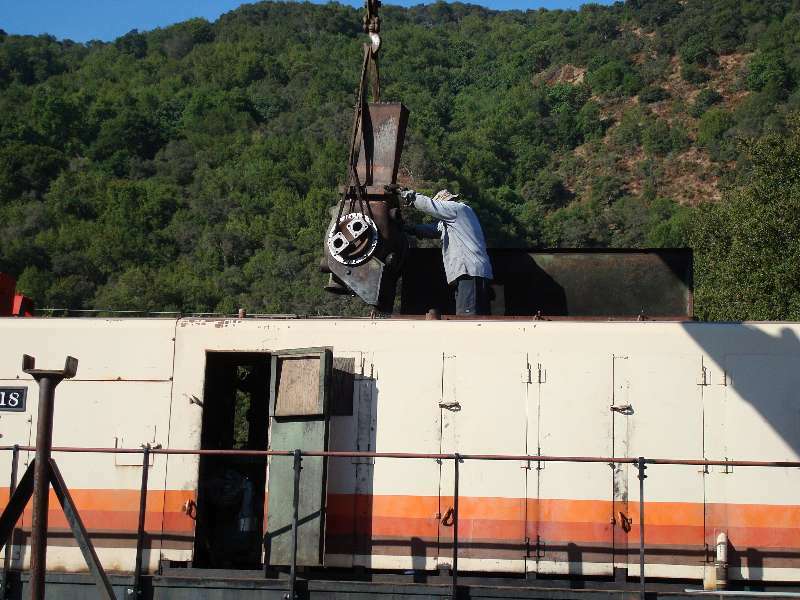 Our Alco 6 cylinder model 251 is equipped with a Alco model 320 turbosupercharger, the function of which is to supply the engine with a high volume of air to be mixed with fuel in the combustion chamber. The turbo makes the engine more efficient and since it is driven by the exhaust gases, does not put any mechanical drag on the engine like a supercharger. When we eventually got the engine running, we found that the turbo made a rather distressing noise, much like the sound of playing cards in bicycle spokes. In addition to the racket, it would not speed up as it should and the engine smoked badly with the throttle above run 3. I made a recording of the noise which can be found at this link. I made contact with Globe Turbocharger Specialties in Reno, Nevada who advertise that they rebuild the model 320 turbo. They said that they had never heard a noise like this but said they would help with our little project. In order to pull the turbo, a small roof hatch, which includes the exhaust stack surround, was removed. 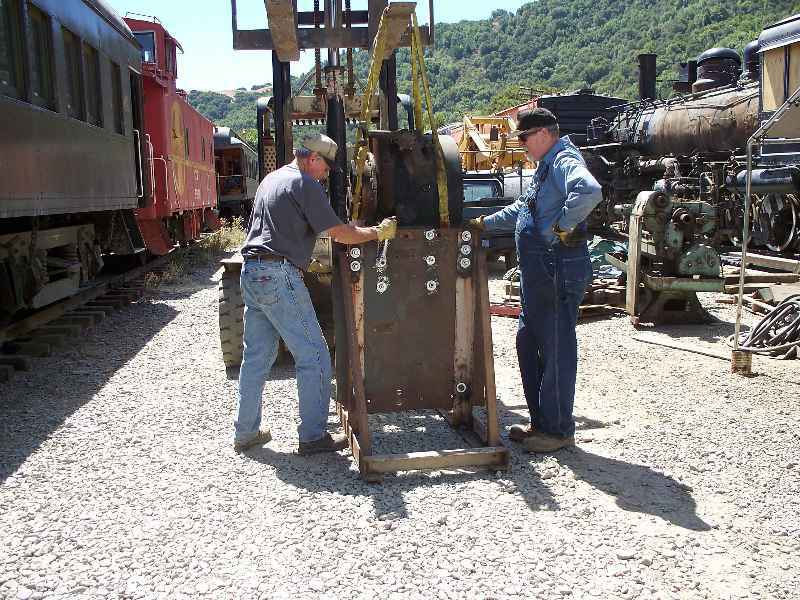 After removing the air filters and connections to water, oil, exhaust and inlet, the 1200 pound turbo was lifted out of the locomotive. 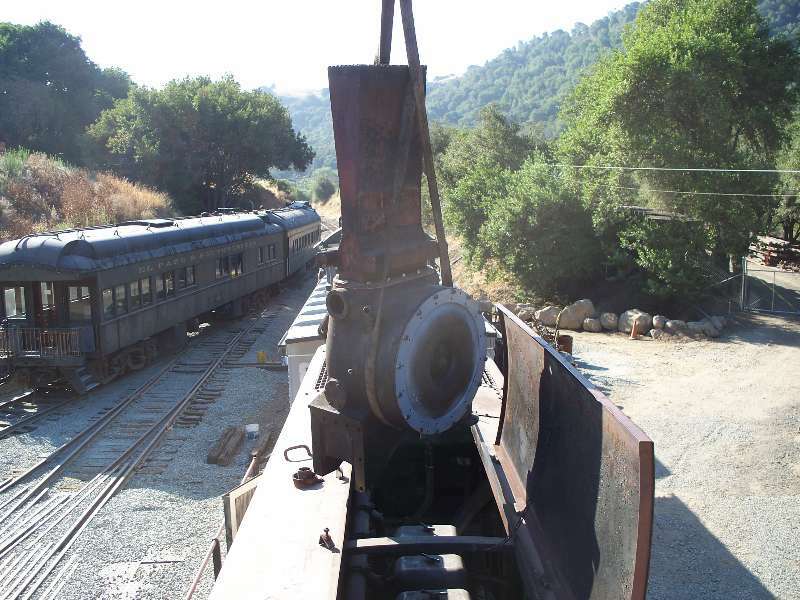 Once out of the locomotive, the turbo was mounted on a stand made from angle iron and a piece of the front end of the 1218 that we had replaced. 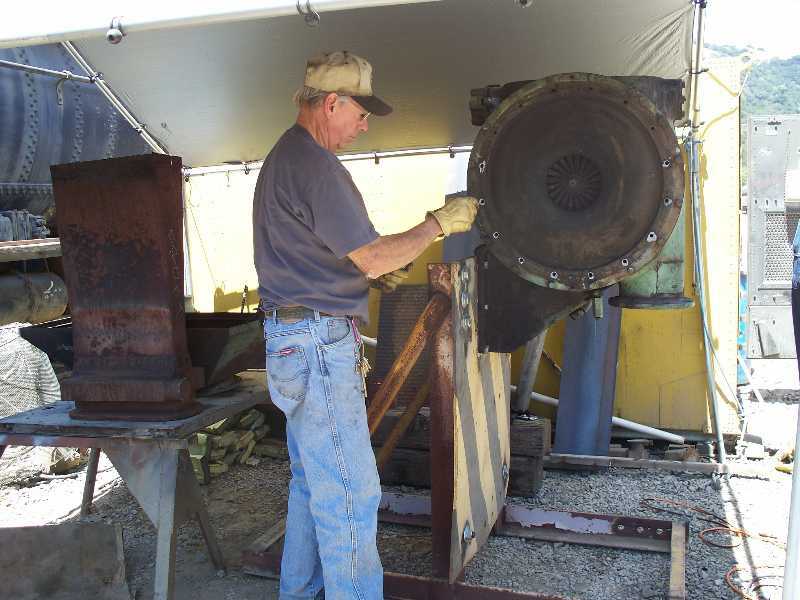 Rich is seen removing the ring of bolts from the air inlet casing that surrounds the inducer and impeller. The two fans form the compressor which sends air to the engine. Upon removing the casing, we discovered the reason for the problems with the turbo. It was full of greasy crap and carbon. The air passages were almost completely plugged. Photo 1 is looking into the air chamber where it exits from the turbo. 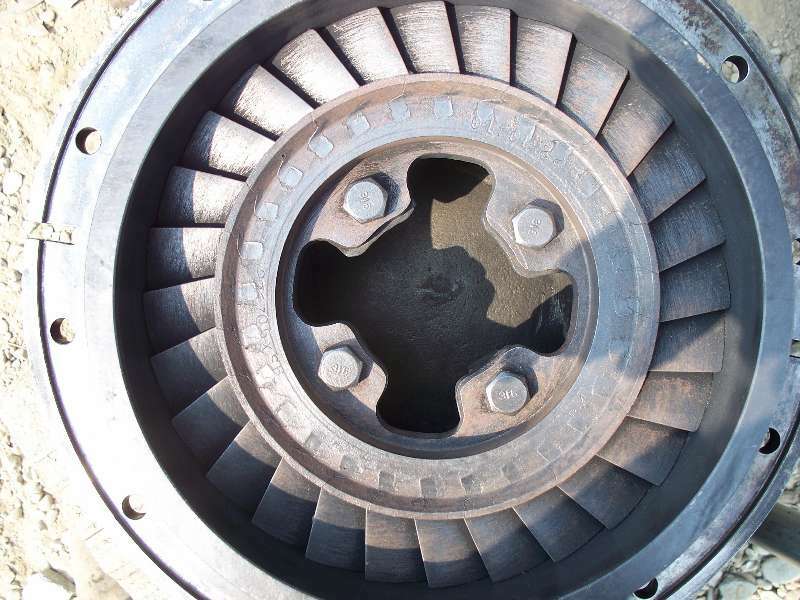 The slotted thing in the center of the opening is the diffuser where the air is discharged from the impeller. 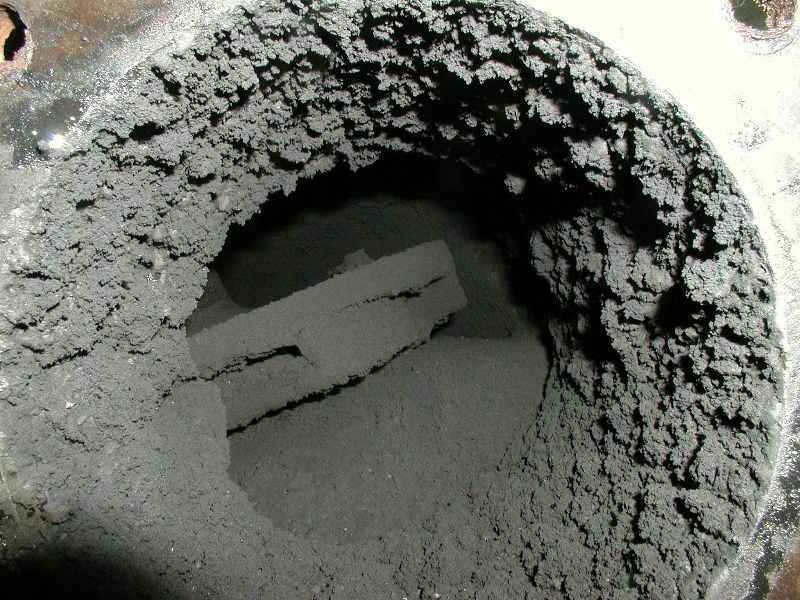 Photo 2 is of the air inlet casing itself. 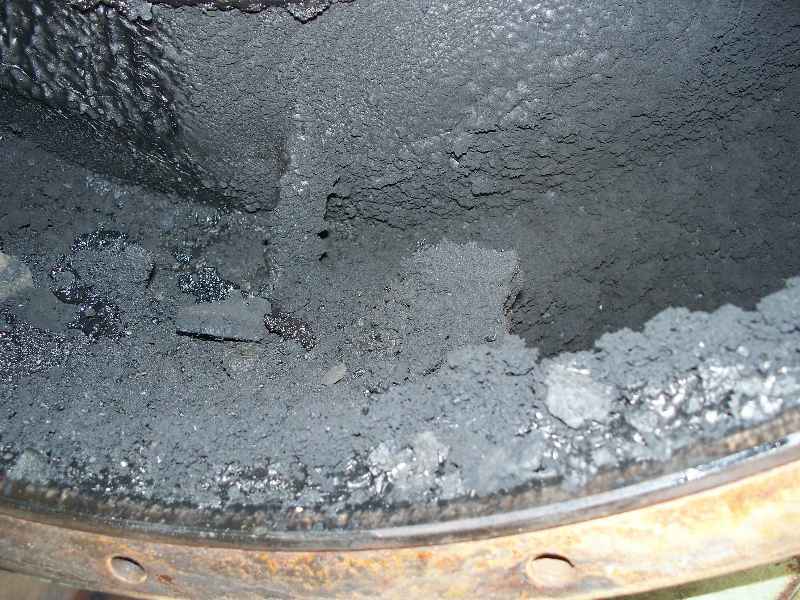 Photo 3 is a close-up of the diffuser showing the nearly completely plugged air discharge passages. Photo 4 is the same as photo 3 after the crud had been cleaned out of the chambers. 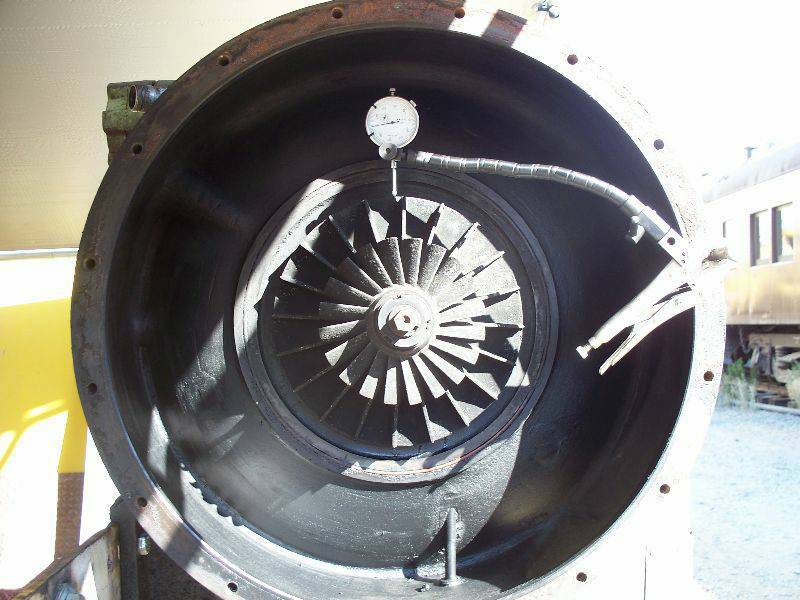 Photo 5 is the inside of the air chamber in the main turbo casting. And, photo 6 is of a happy Jeff Coker who truly loves to clean things and is darn good at it. 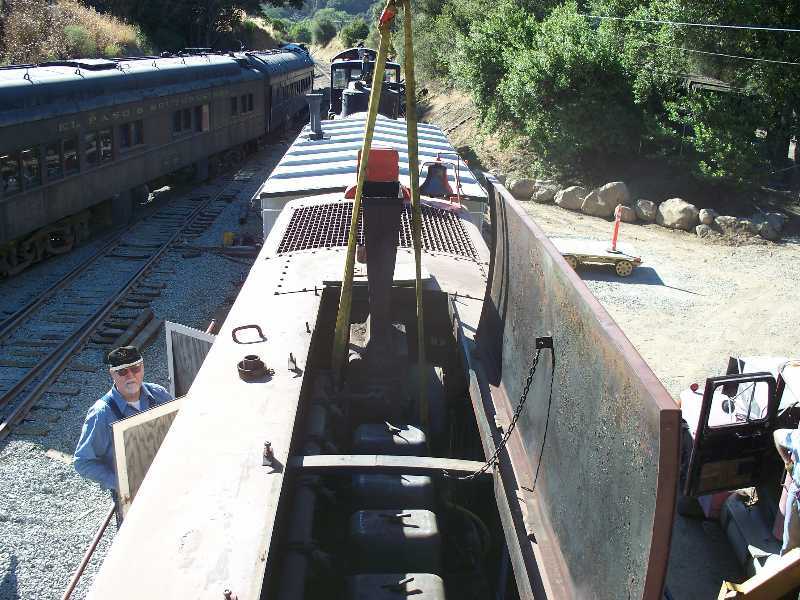 The next step was removing the gas inlet casing. 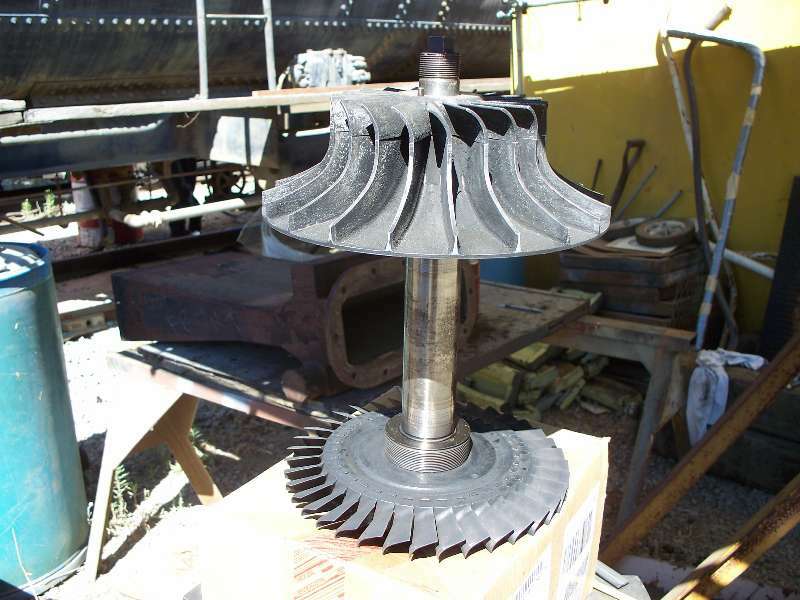 This is the casting that connects to the engine exhaust and directs the exhaust to the turbine which spins the shaft driving the impeller. 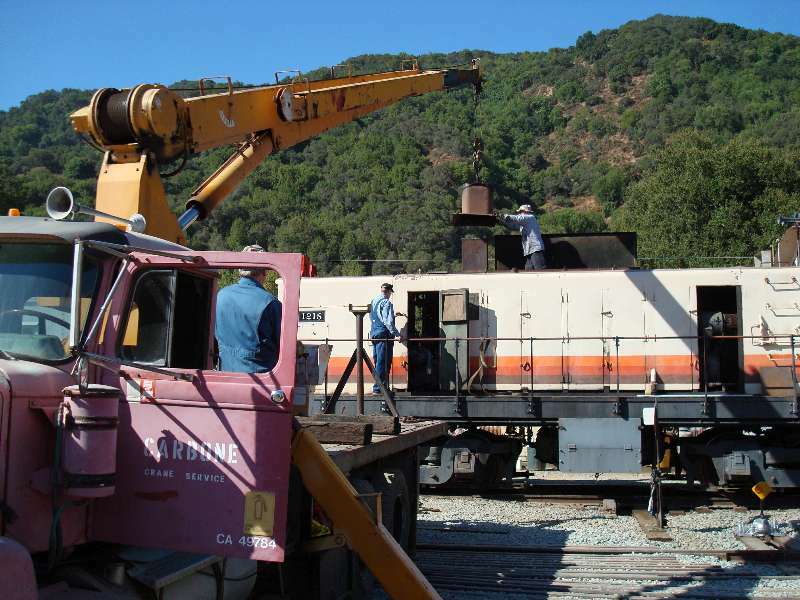 The second photo shows the exhaust connections in the locomotive. Once the casings were out of the way, I could make some measurements to determine the amount of wear in the turbo bearings. The dial indicator indicated (?) that the shaft radial clearance was .008 (8 thousands). 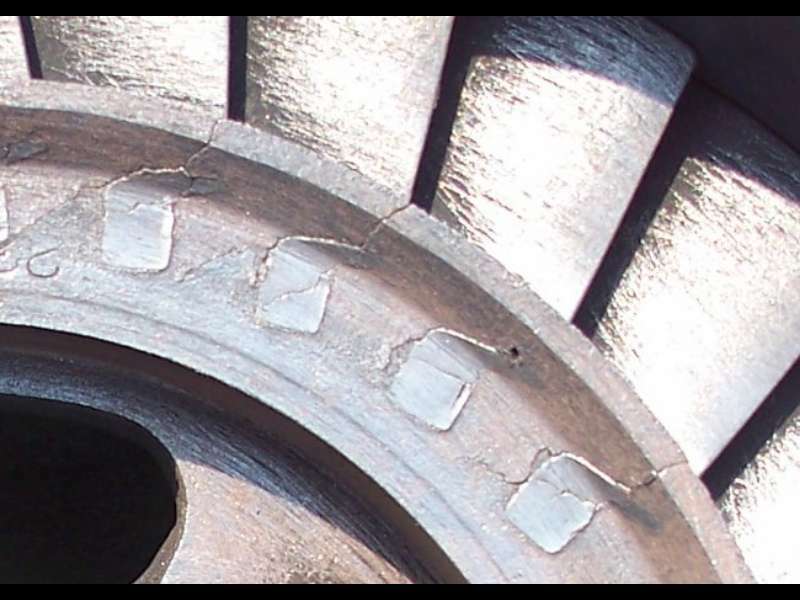 The specifications call for a minimum of .005 and a maximum of .009 so the wear was actually within tolerance. The other critical measurement is the amount of end play in the shaft. The specifications call for a minimum of .007 and a maximum of .016. Our shafts moves .014 so this measurement was also within tolerance. 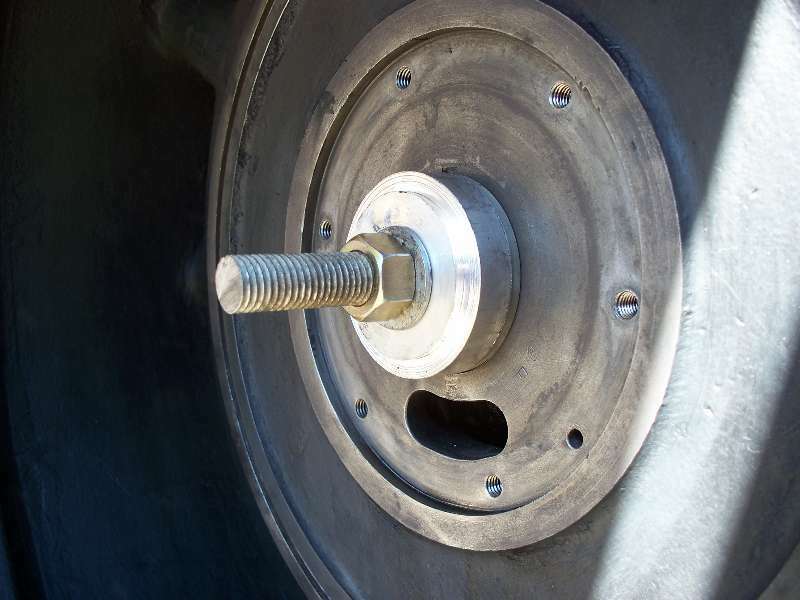 But, given that the measurements are at the upper end of the limits and the air side bearing is damaged, we are changing the bearings and will adjust the end play. 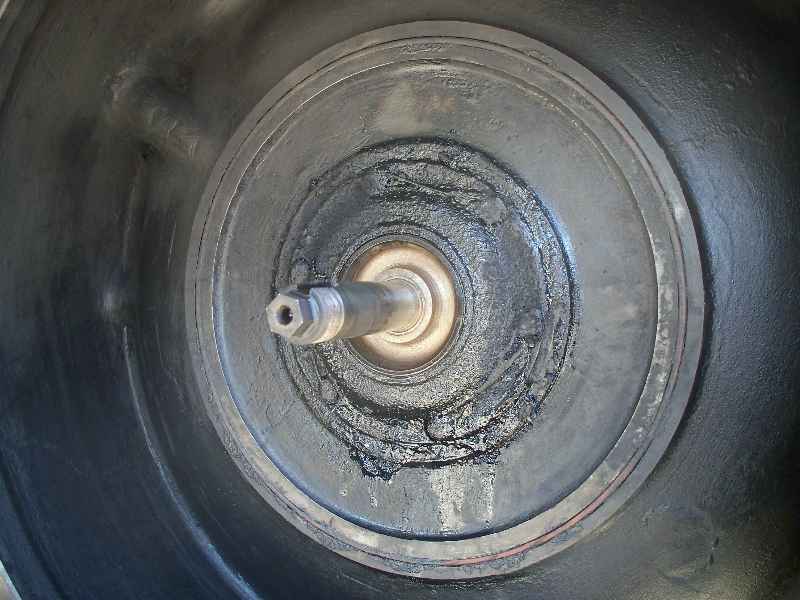 Photo 2 shows the inducer and impeller that forces air into the engine. It looks like one part but it is actually 2 aluminum castings slid on the shaft. 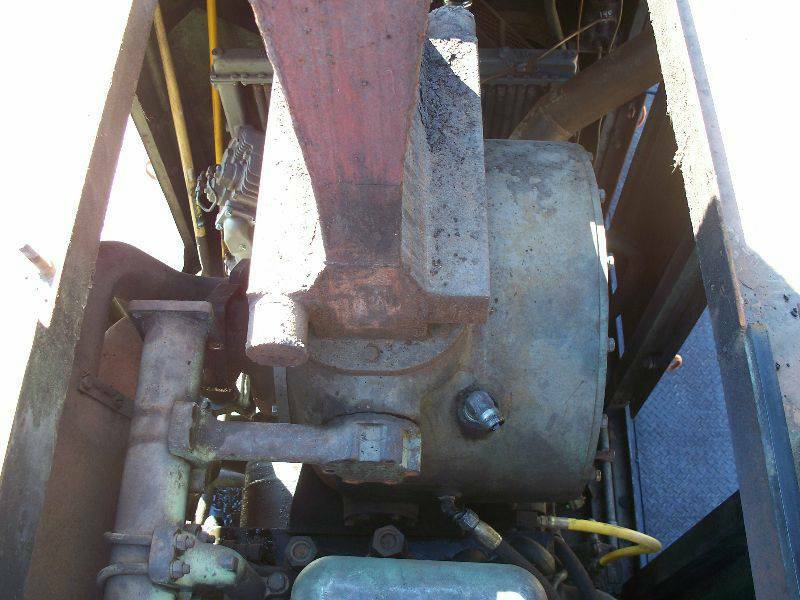 Photo 3 is of the air side oil seal and photo 4 is of the air side oil slinger which sits inside the seal. 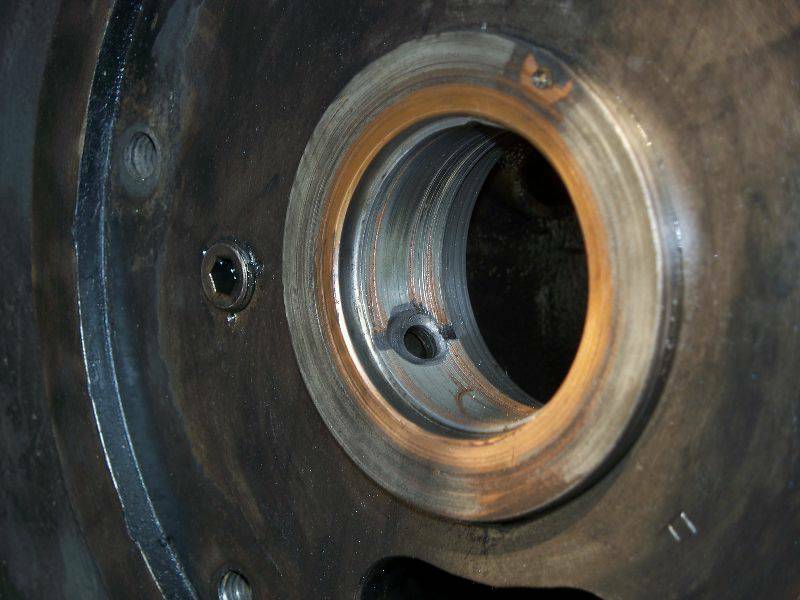 Photo 5 shows scoring on the surface of the air side bearing. 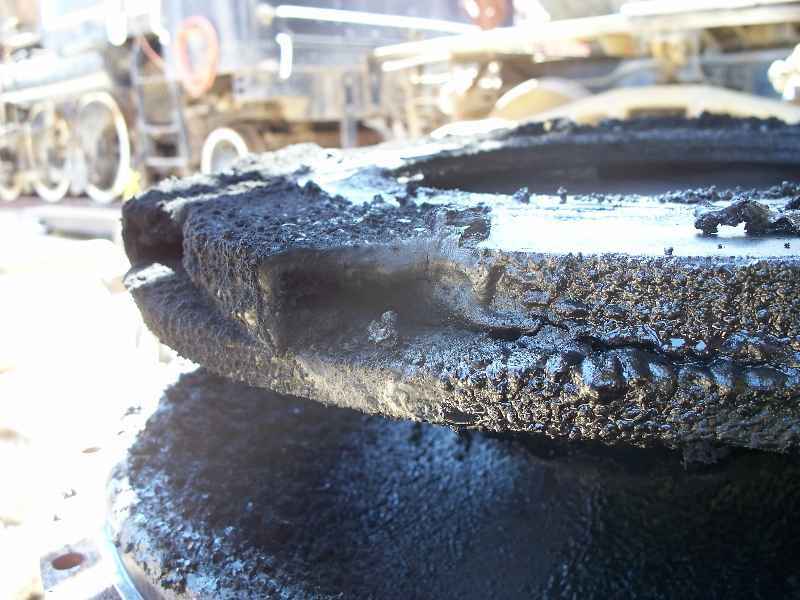 This was likely caused by dirt in the oil which fortunately, did not affect the shaft. 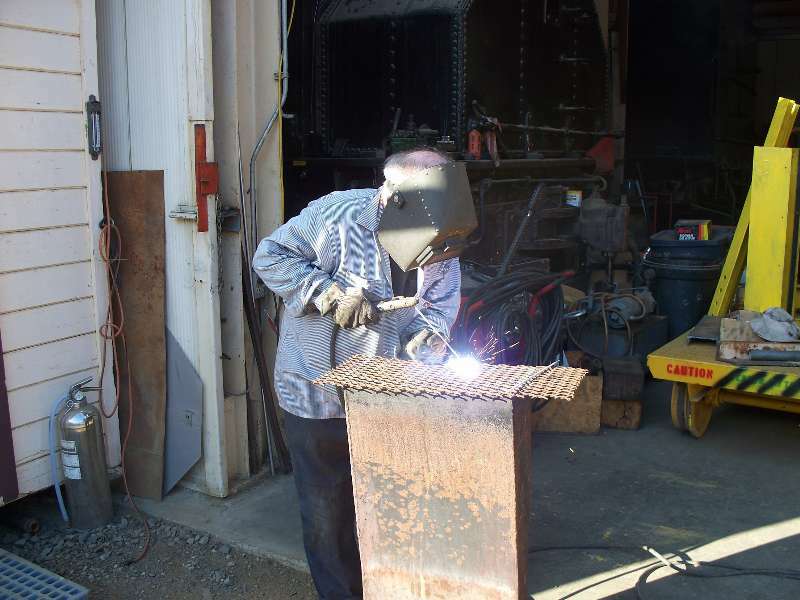 And then, in the process of cleaning the gas inlet casing, Jeff discovered that the nozzle ring was badly cracked. There are little cracks radiating out from nearly every spot where the nozzle blades are inserted. 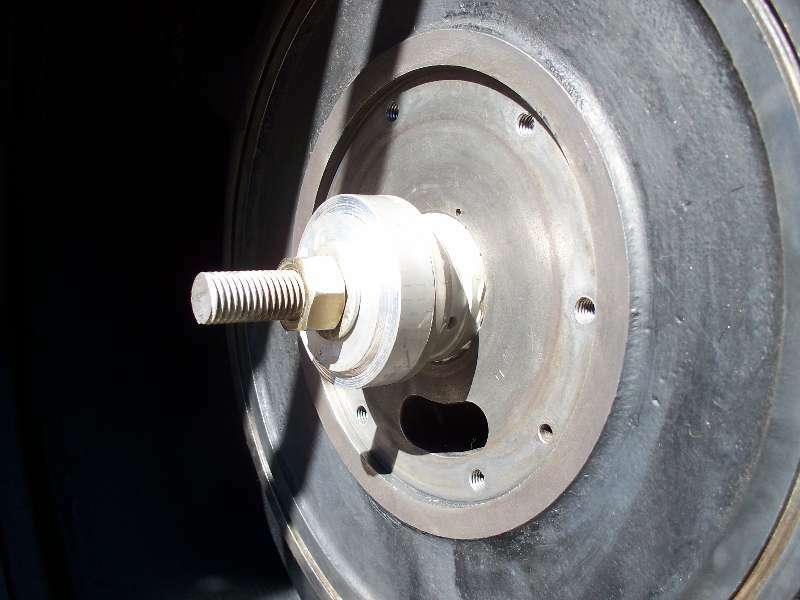 The nozzle ring directs the exhaust gasses to the turbine blades and since this is not a rotating part, the only explanation is that metal fatigue set in after around 50 years of hot exhaust gasses. Photo 1 shows the nozzle ring and photo 2 illustrates the cracks. This was an unexpected expense but, replacement of the ring was the only real option. We had to make a special tool in order to press the new bearings into place, Photo 1 shows the tool and photo 2 shows the tool, ready to pull the new bearing into place. 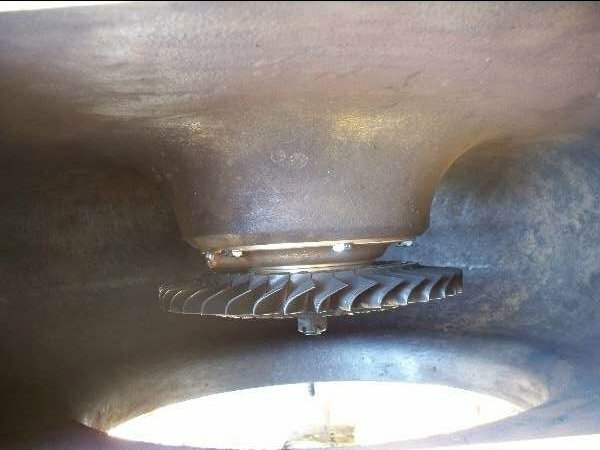 Photo 3 illustrates the bearing, all snugged up against the casing, The bearing on the turbine side was pulled into the casing in the same manner. 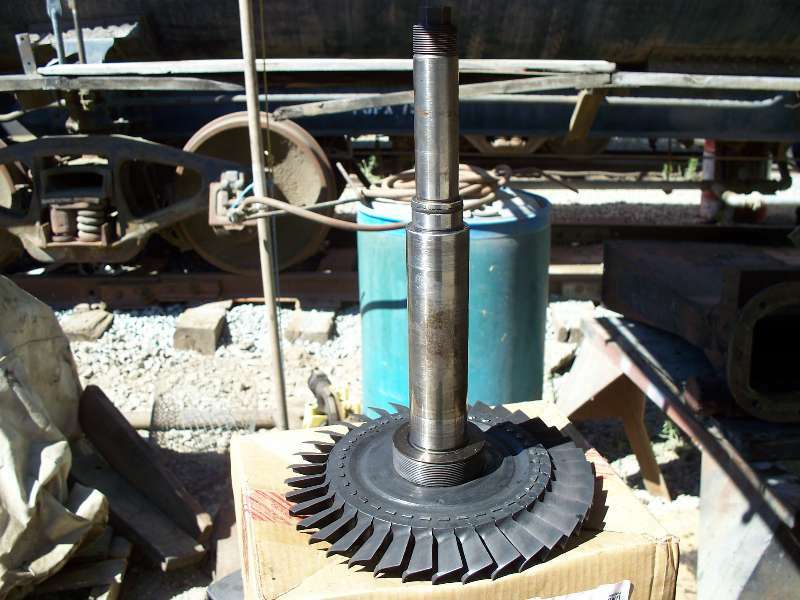 Here are a couple of photos of the turbine shaft and its parts. 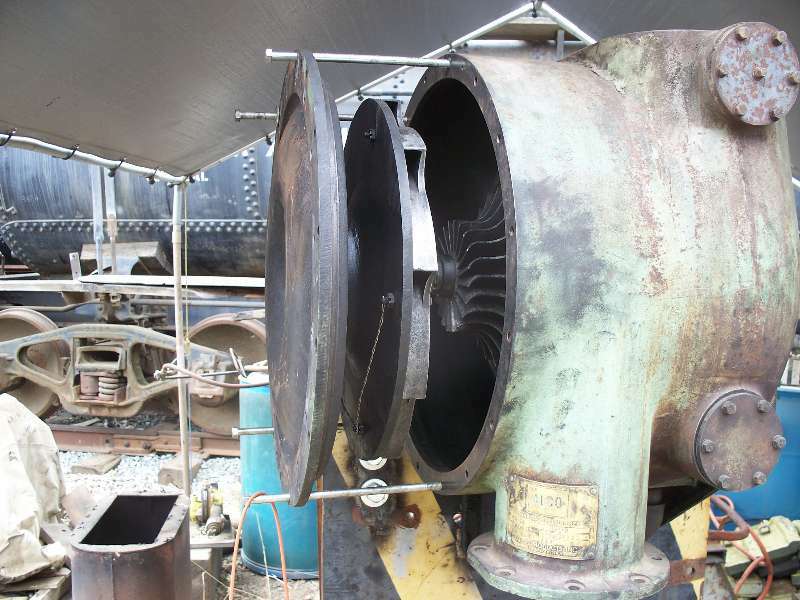 On the bottom is the turbine which is driven by the engine exhaust gasses. 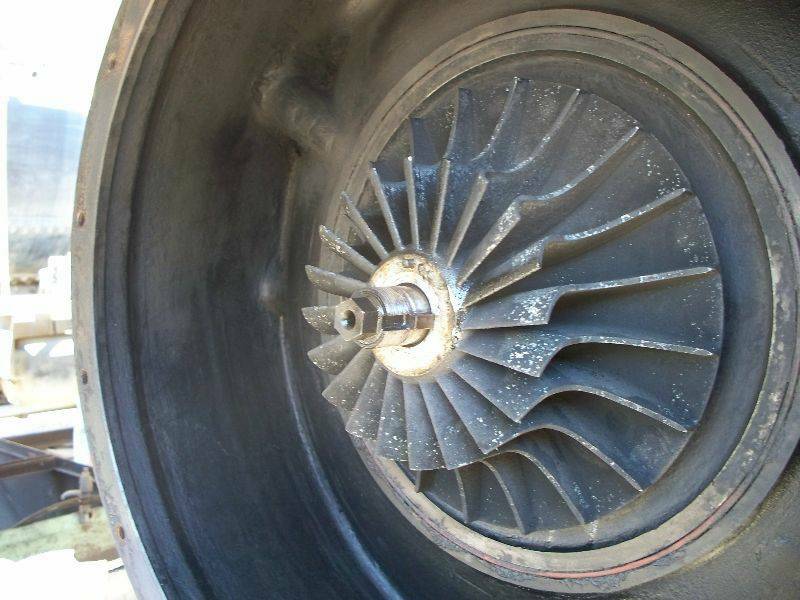 At the top are the inducer and impeller which compress the intake air and feed it to the engine. 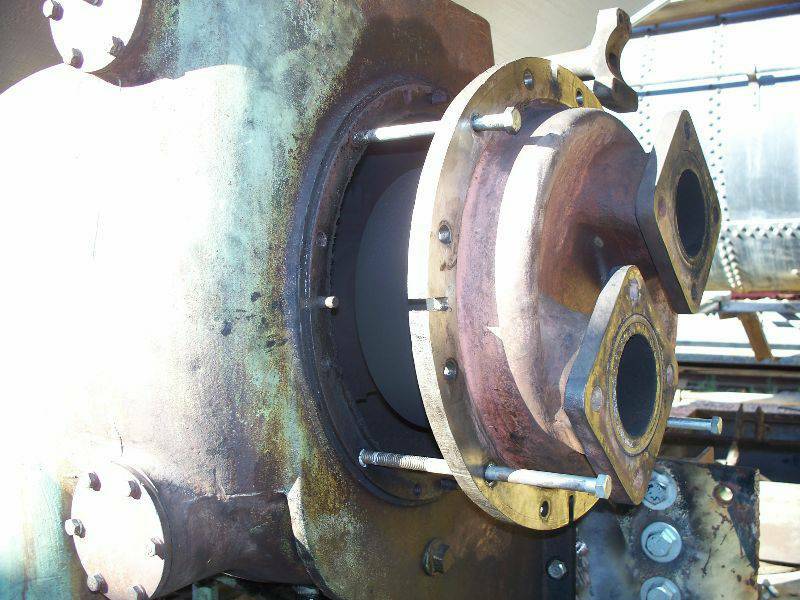 Because the turbine is exposed to the hot exhaust gasses, it is made of stainless steel. 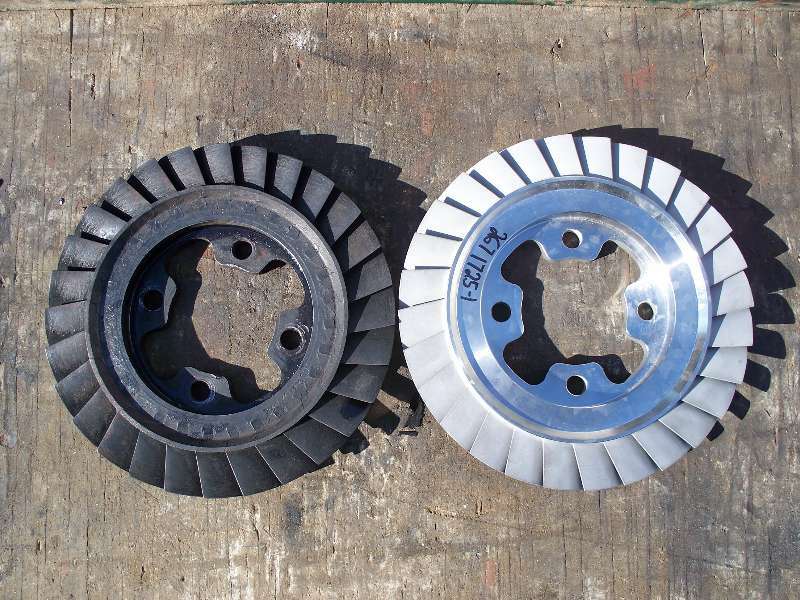 The inducer and impeller are made of aluminum. 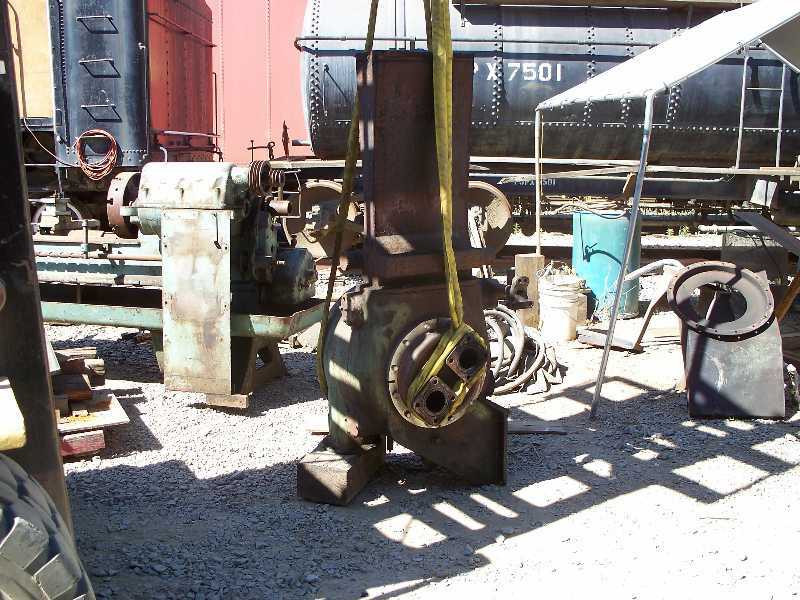 All the parts are in remarkably good condition considering that they are over 40 years old. 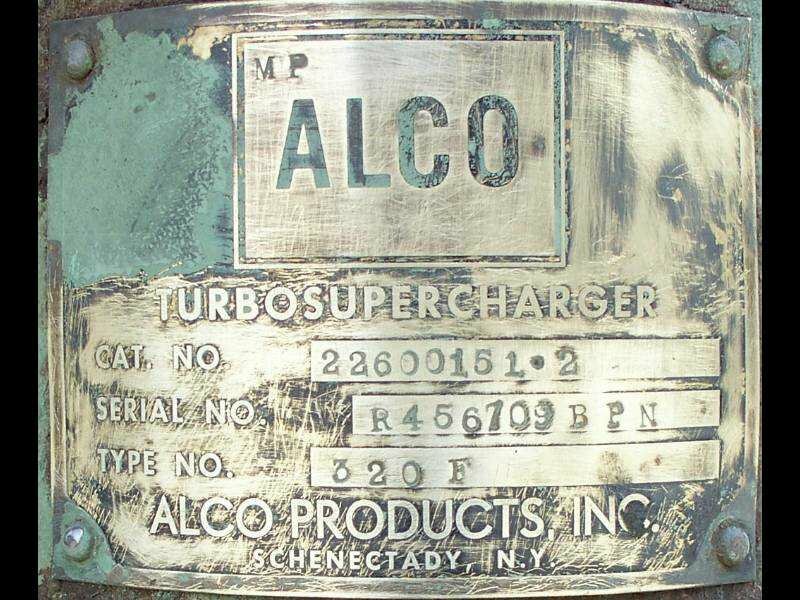 Yes, the locomotive was built in 1955 but the turbo was upgraded by the SP in 1965 when Alco redesigned the internal parts. 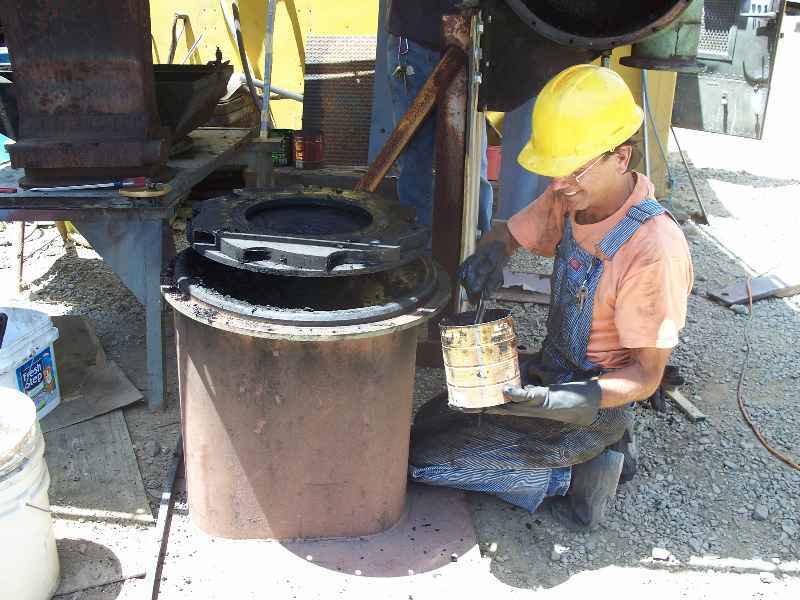 After the new bearings were installed, the oil seals were put in place. 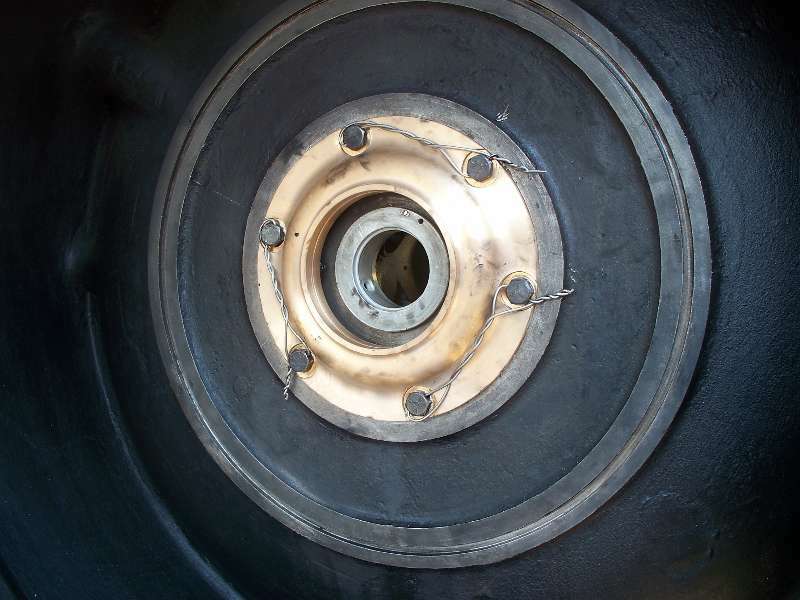 The one on the turbine side had to be carefully spaced out from the casing as it has to maintain a critical clearance (.004 - .008) to the backside of the turbine wheel. One all the measurements were confirmed, stainless steel safety wire was applied. 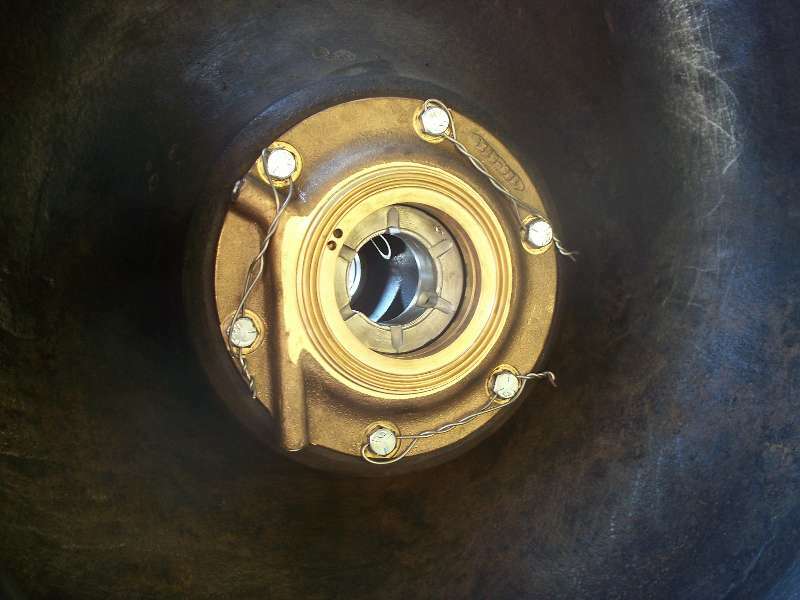 Photo 1 is the turbine side, photo 2 is the compressor side and photo 3 is looking down the exhaust at the turbine and oil seal in place. Our attention now turned to the air side. 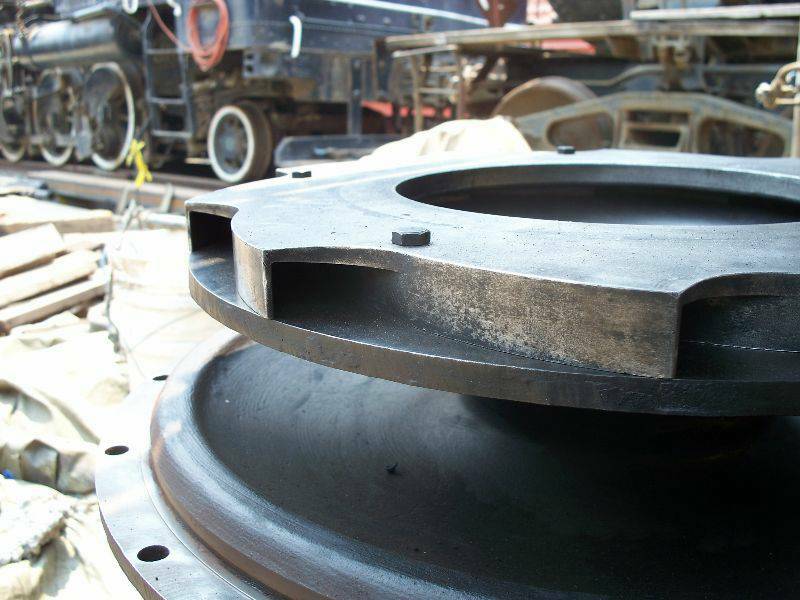 The inducer and impeller were applied to the shaft and the lock nut was torqued to 100 foot pounds. We decided to spin the turbo with air and with oil being poured into the oil line and a strobe tachometer watching the RPM, managed to get the turbo up to 10, 000 RPM with no unusual noises or vibration. The bolts that hold the diffuser ring to the air inlet casing were torqued and safety wired with stainless steel safety wire. 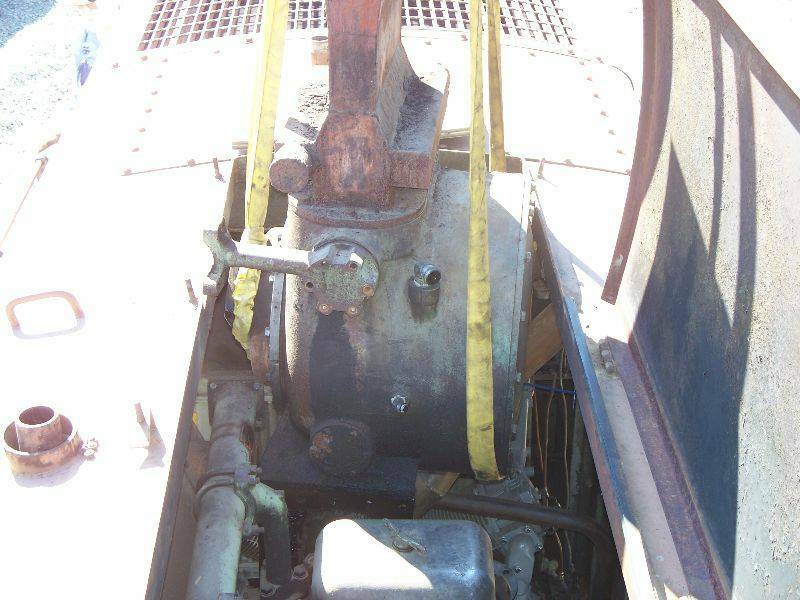 The casing was hung from 4 long bolts and carefully positioned into the turbo body. 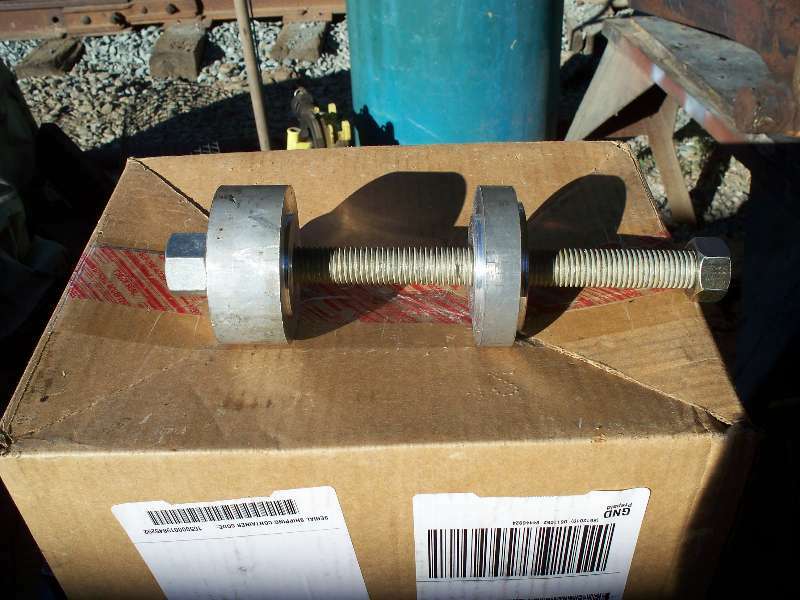 Sixteen 1/2" bolts were applied and torqued to 60 foot pounds. We once again spun the turbo on air and again found no sign of anything but good news. Photo 2 is of the old and new nozzle rings. The brand new $3500 one, rather than being an assembly of parts like the old one, is a solid cast stainless steel part. No wonder it cost so darned much! 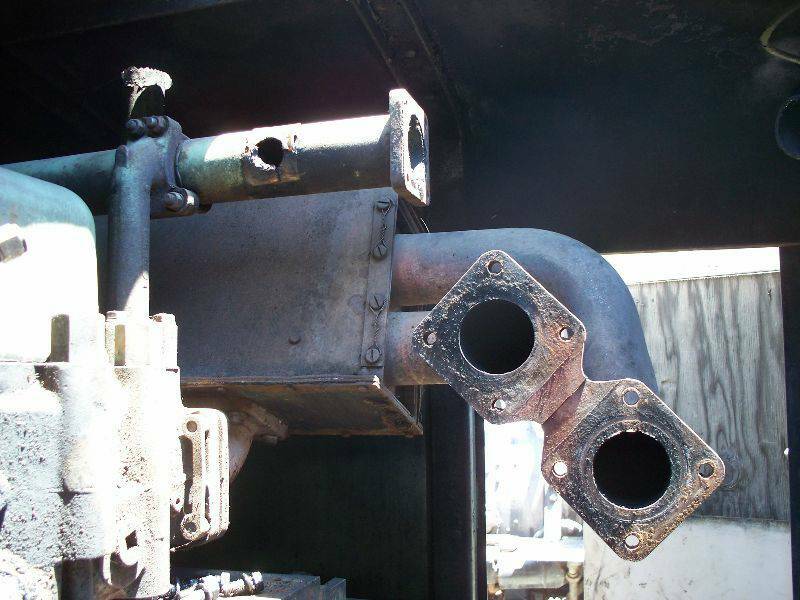 It was applied to the gas inlet casing and the assembly was set in place, again using 4 long studs. 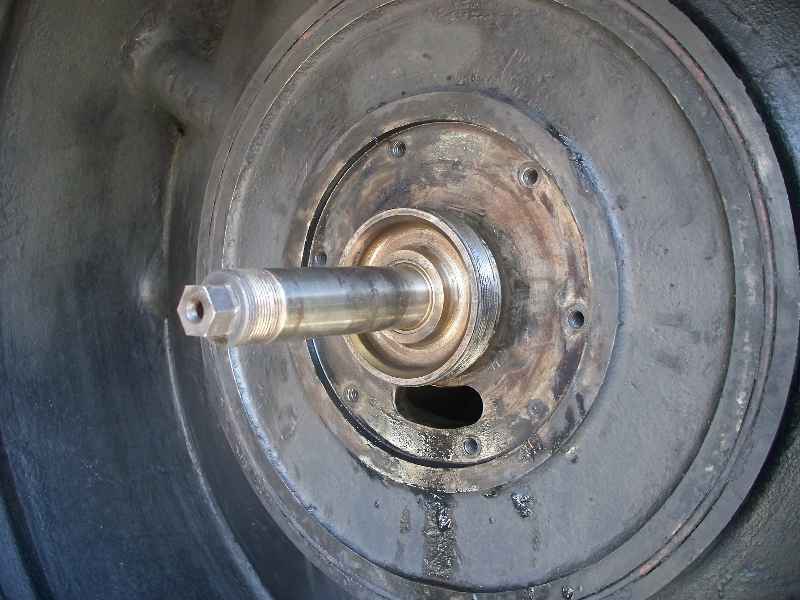 Once the bolts were in and properly tightened, the turbo was spun up one more time using air. This completed the turbo overhaul and made it ready to put back on the engine. One final detail needed was the replacement of a missing screen on top of the turbo outlet. Here I am doing the deed while Jon watches to make sure I don't set myself on fire. My leather welding jacket was at home. 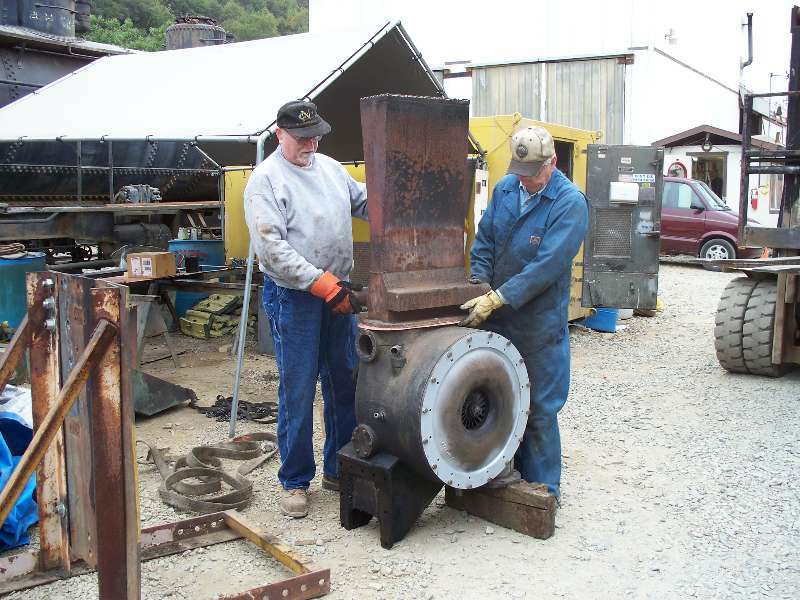 The turbo was removed from the temporary stand and Rich and Jon lifted the stack back in place. 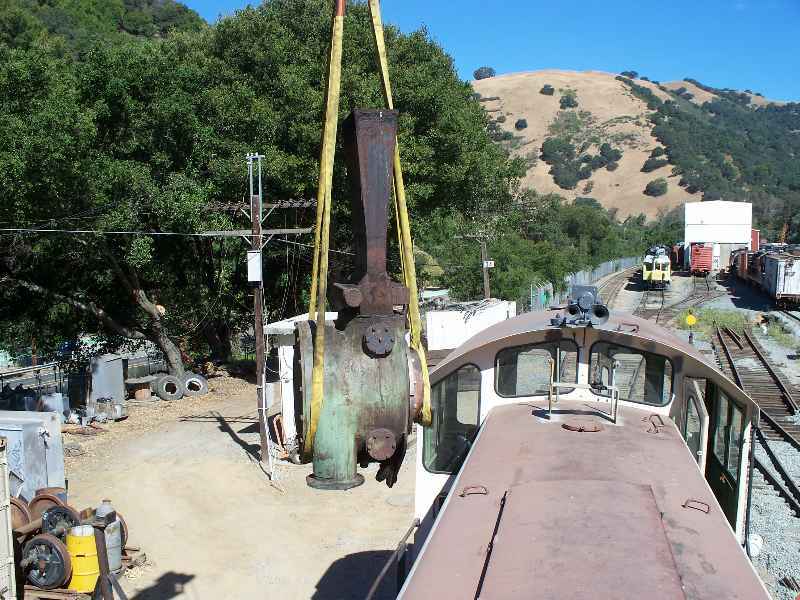 After suitable rigging, the turbo and the 1218 were moved to a spot where we could get at them with our crane. With Rich on the controls, Jon watching our backs and me guiding the turbo, it went back into its home with little problem. 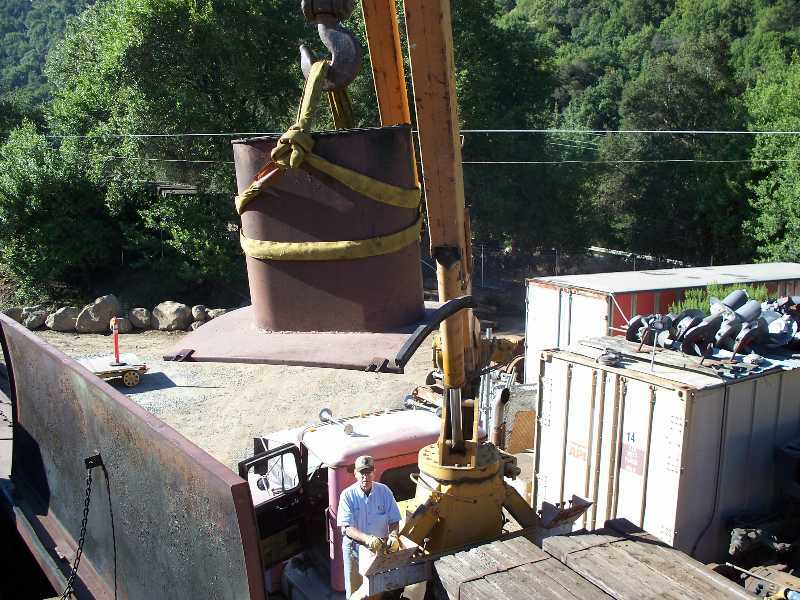 Jeff caught one final shot of me guiding the stack surround into place. 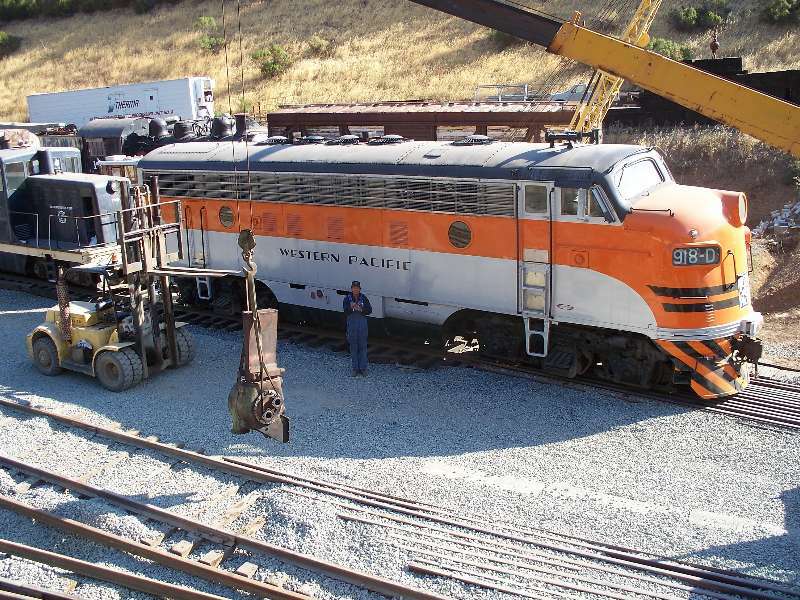 After a few hours work connecting things up, the 1218 was fired up and the sounds and sights of a running Alco S6 filled Brightside yard, this time without that nasty noise.